Call for councils to get rid of unnecessary clutter in a bid to make streets tidier and less confusing for motorists and pedestrians. Communities Secretary Eric Pickles has called for unnecessary signs, railings and bollards to be removed in a bid to make streets tidier and safer - saying “We need to cut the clutter”. Mr Pickles believes that many traffic signs and railings are put up in the mistaken belief that they are legally required. Although some signs are required by law, government advice is that they are most effective when kept to a minimum. “Our streets are losing their English character. We are being overrun by scruffy signs, bossy bollards, patchwork paving and railed off roads wasting taxpayers’ money that could be better spent on fixing potholes or keeping council tax down. We need to ‘cut the clutter’. Councils have been urged to get rid of unnecessary clutter in a bid to make streets tidier and less confusing for motorists and pedestrians. Communities Secretary Eric Pickles and Transport Secretary Philip Hammond are concerned that the character of the country’s urban spaces is being damaged and have today written to councils leaders. “We all know that some signs are necessary to make our roads safe and help traffic flow freely. But unnecessary street furniture is a waste of taxpayers’ money and leaves our streets looking more like scrap yards than public spaces. Mr Pickles wants communities to tell councils about particularly bad examples of clutter as part of the Big Society in action. Organisations like [Civic Voice], [Living Streets] and [fixmystreet.com] are already helping people alert councils to examples of clutter and showing people how to carry out street audits. The Salisbury Civic Society concluded, after carrying out a survey of over 60 streets, that it has become cluttered over time markedly reducing its character. 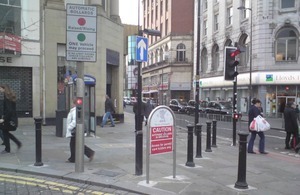 They found the city centre was littered with hundreds of bollards including one parking area for 53 cars had 63 bollards. Decluttering Kensington & Chelsea’s High Street saw a 40% reduction in road traffic accidents and a 60% reduction in pedestrian accidents.